1. This module is only suitable to be used indoors and forbidden to be operated outdoors. 2. The power of the connected load mustn't be higher than rated power. 3. Wiring should be done as the instruction, wiring process should not be disturbed. DROK digital voltage amperage power meter voltage measuring range is AC 80-260V, current measuring range is 0-5.000A, rated power is 1100W. 3 in 1 Meter: the multifunctional meter can be used to measure electrical voltage, current and power value, can be switch by pressing the key. 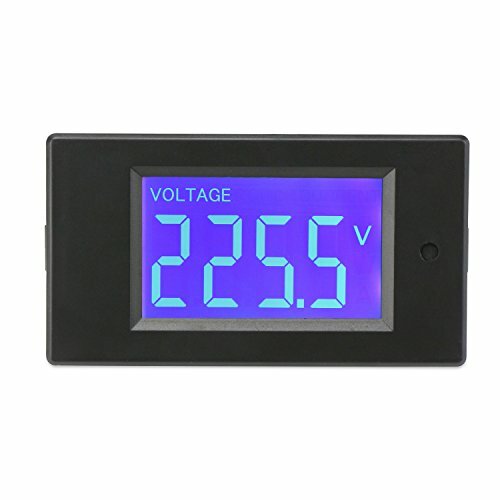 LCD Display: DROK multimeter adopts large LCD display, blue backlight, you can view parameters clearly from every angle. Memory Function: it will recover to display the data that was displayed before power off. Note: this module is only suitable for indoor use, please don't operate outdoor.